Why did you become a business-owner? What’s your mission--Is it the same today as it was the day you started your business? Now, ask yourself the same thing about your employees. Can you confidently say that your employees share your goals and overall mission? Is everyone really on the same page? Is there a company-wide air of trust and togetherness? This basic idea is the foundation of positive company culture. 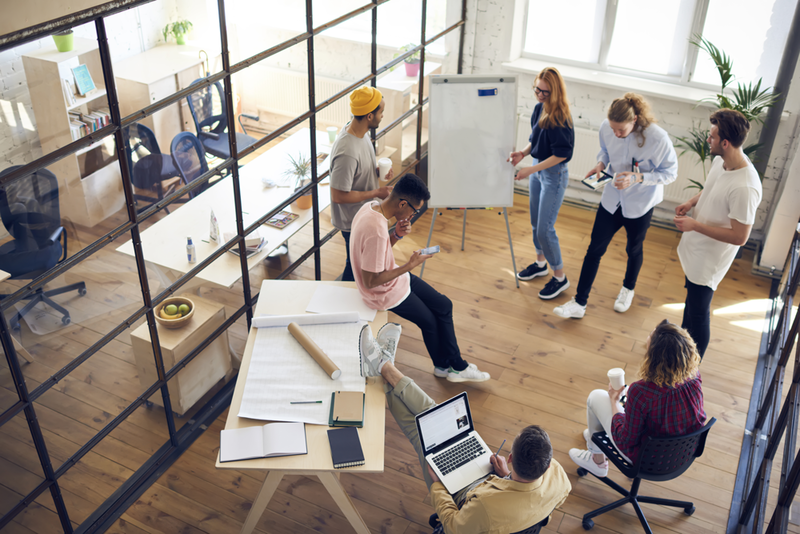 Yes, each of your employees is there for a paycheck, but thriving in a positive business environment--ultimately growing your company--is about so much more than just that. Your employees should want to solve the same problems you do, and they should have the same objectives. Especially when it comes to small businesses and startups, CEOs and managers might notice their employees putting in the bare minimum, and they may see a steadily revolving door of new hires. But managers who are put in this position can only say, “It’s not me, it’s them--the work must be too hard!” so many times before they’re fore come to the realization that it really is all about the company. If you’re well past the startup phase, now is the right time to foster positive company culture--before it’s too late. As a business-owner, changes in culture start and end with you. Think about it this way--it’s a return on your investment. If you spend time and effort creating a positive work environment, it will only benefit you. And in many more ways than one. But you can’t create positive company culture overnight. We’ll discuss several different ideas to keep in mind when you think about your business. Before you know it, you’ll feel more comfortable and confident in your brand, your team, and yourself than ever. First, do you know what your values are? Without core values, your business has no direction. You have no baseline, nothing for your employees to work toward. Your company’s values should be evergreen and consistent. And, most importantly of all, they should be authentic to your brand, not just anyone’s brand!. Note that we specifically said your brand and not you as a person--your values should be so intertwined in the company itself that they will live on no matter who’s in charge. So, how do you find your values? You need to have a ground-up discussion with your team (and maybe multiple), which isn’t always as easy as it seems. Figure out what’s important. Both to you AND your team. Does your team want to have the power to make different types of decisions? How about communication--where does this rank? How important is a “fun” work environment, and how fun? The questions can feel endless, but are all equally crucial to address. Schedule a meeting in advance and ask your team to come to the table with a few ideas. Ask them to think about what’s important to them both as an individual and as a teammate. Once you meet, talk about how their ideas relate to the company’s success as a whole. Here, you’ll be able to connect your ideas with theirs much more clearly, leading you to a common set of core values. You’ll be comforted to see that you and your people really do want the same things. When your set of core values is established and in practice, your team will feel, well, like a team. They’ll feel unified because they will share the same goals. Togetherness is a prime aspect of company culture, and core values will help you get there. If your employees see you as an all-knowing, secretive, unavailable, possibly dishonest and shady CEO, trust and togetherness will never ever happen. And it might even lead your employees to think you’re vindictive, and aren’t working in their best interests. Who would want to work for someone like that? Now, this isn’t to say that you should lay out every last detail of your business’s financial history on the table for your team to study, but openness is important to your business’s success. Being open allows your team to relate to you both as a person and as their leader. Start with your calendar. If you aren’t always present in the office, or are typically hard to reach because of other engagements, make sure your employees know what’s going on. Make your calendar public and accessible to all members of the company, and request that they do the same. That way, if one of your team members’ emails isn’t answered right away, for example, they won’t start to wonder or second-guess. Discuss your own time management with your team. Maybe your staff members are more receptive to meeting in the mornings rather than afternoons. Or, if they need to send you an email while you’re away, maybe it would be best at a certain time of day to do so. Be open to altering your schedule based on their needs. Setting and demonstrating these boundaries--together--allows you to demonstrate that you’re easygoing and flexible while also maintaining structure. As a manager or CEO, you should be ever-present to your team in one way or another, so it’s up to you to facilitate those expectations. Transparency shouldn’t stop with you, either. It should be embraced company-wide! Your people are most likely to feel most confident when they know they’re doing something the right way and at the right time. Are you sure that your people are the right people? This is much easier said than done, but as your company culture progresses, the right (and wrong) people will make themselves known. If you start to notice someone standing out from your team for the wrong reasons, they will eventually bring everyone else down. In a smaller company, this person might avoid collaboration, provide unclear or unfinished work, or distract other teammates from their jobs. Your team spends 8+ hours daily at the office--don’t you want them to be surrounded by positivity? If the rest of your team is on the right track and really embodies your company values, any “cancerous” team members will stick out like a sore thumb, whether or not you see them on a daily basis. If you’ve had conversation after conversation with negative team members and nothing has changed--you’ll need to get rid of them. It might seem harsh, but it really is that simple. It’s the sacrifice you must make in order to achieve long-term success, and employee retention and happiness. When it comes to hiring, really drive it home during training. You want your new hires to feel comfortable, confident, and ready for success right from the get-go. Any boss who is proud of his or her company should do their best to show it the most while training new hires. It’ll leave them feeling inspired and eager to work with like-minded teammates. A modern office design alone might not exactly make or break positive company culture, but organization and clarity across the whole office (not just within the work itself) makes for a beneficial environment. There are infinite factors to keep in mind when planning your ideal office space, but ultimately, you want your office to reflect your core goals and values. If you or any of your employees feel inhibited or stifled by any aspect of the office, it’s definitely time to make some changes. Talk to each of your teammates separately to find out what they want in their ideal office. More space? Less space? Privacy? Then, meet with everyone together to discuss these ideas. It could be something as simple as desk rearrangement that gets everyone’s creative juices flowing. If you’ve emphasized “fun” as one of your in-office goals, make this apparent. And encourage fun behavior, too. There’s no use in having a foosball table in the conference room if your employees are discouraged from using it. Just like transparency and trust, being able to have fun with your teammates creates a sense of togetherness. Of course, every business-owner wants to create success and make money. But you simply can’t get there without positive company culture. Positive company culture is all about togetherness and trust. When you have these two things, you can be assured that your teammates will be confident in their work, and that they share the same core values as you do. It’s impossible to change your company culture in the span of one workday or overnight, but don’t lose hope--you will have to make some sacrifices along the way, but the benefits will greatly exceed the effort you and your team put in.